Its that time of the year when everyone is thinking about filing their Income Tax Returns for the Financial Year 2017-18. If you have any refunds to claim, then the only way you can do it by filing your Income Tax Returns. You will have to file your Income Tax Return as soon as possible. Though the last date to file Income Tax Return for the financial year 2017-2018 is 31st July 2018, but if you want to get your tax refund early you will have to file your returns early too. Ideally, a salaried Individual must receive his/her Form 16 before 15 June’ 18, in order to file their income tax returns. In case, if they don’t receive their Form 16 by this date they can file their return without it and can get their tax refund as early as possible, but this whole process is supposed to be done with a lot of caution. For filing Income Tax Return without Form 16, the taxpayer should ideally take help of a financial or tax expert. 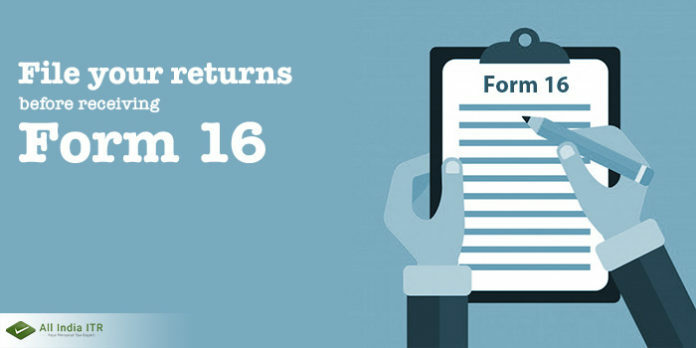 If you file your Income Tax Return without Form 16, you must ensure that as soon as you receive your form 16 or form 26AS you must check whether the salary and TDS details mentioned on the respective forms is correct, otherwise you will have to file revised returns. You will have to include the various sources from where you receive or earn income. Remember, if you fail to mention any of it, then in that case you may have to rectify your mistake by filing a revised return. You can claim credit for TDS and advance tax/ self-assessment tax. Verify your return with the same documents and maintain them for further tax audit.